Have you been spending countless nights manually sending out SMS appointment reminders? Not anymore. Let the Simple Inked do the work for you, and save your nights for more leisurely pursuits. Setting up your 2 Way Messaging. To set this up, go to Admin then into the SMS & Email tab. 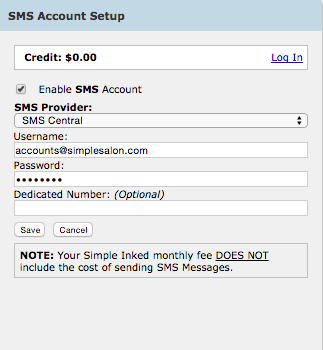 You should have already set up your SMS Central account, but if you haven't then check out the Setting up SMS Central Account and Connecting it to Simple Inked article. Once you have set up your SMS Central account connection, your SMS Account Setup section in the SMS & Email tab in Admin, should be looking something like this (but you will hopefully will have some credit in yours). Click Log In and this will take you across to your SMS Central account. Once you are in your SMS Central account, click on the SETTINGS tab (top right hand side). Over on the left hand side you will see an vertical menu bar, select RULES & TRIGGERS. Click on the green box on the right hand side ADD RULE. Give it a name (something like 2 Way Rule SMS) then Scroll down and click Next. Once you're sure it is entered in correctly, scroll down and SAVE RULE. Now you are all set up to automatically send Appointment Reminder SMS's and when your clients respond with Yes (it must be Yes it cant be just a Y) it will show on their appointment as "Confirmed" and you will see a red C appear in their appointment. Important Note: One SMS is 160 Characters, if you go over this the system will automatically expand the Character limit, however you will be charged for two SMS's. Check out the other articles in the SMS & Email section of your Knowledge Base.